Hi there. My question is about substituting the oats. I’d like to make it gluten free but we can’t seem to get GF oats in Australia. Any suggestions? Just more plain flour? Thank you. This looks amazing! One question- I noticed you mentioned adding vanilla extract in the description, but the recipe doesn’t have it listed as an ingredient or added in the directions. How much vanilla extract should I be using? Thank you! such a wonderful recipe I have added it to my recipe box. Love your recipes so much! This recipe looks delicious! I love all the photos, you make it look so easy. I have never tried coconut flour, but I am going to be brave and check it out. 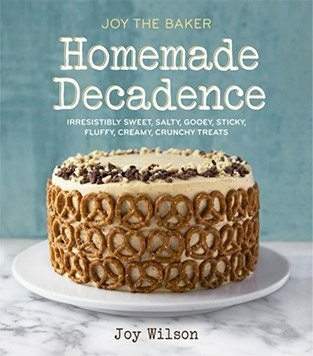 Oh, Joy… you have been one of my favorite bloggers for as long as I’ve loved food blogs. Without fail, your recipes are absolutely incredible and they’re my go-to gals anytime I need to bake. I have to say that I am ECSTATIC that you’re dipping into the gluten-free world of baking. I was just diagnosed with Celiac Disease in July, and I’ve managed to create some pretty tasty baked goods. But I’ve so missed recreating YOUR wonderful recipes. Thank you… sincerely. Thank you. Namaste ?? I have all these things and some lingonberry jam that has been asking for some special treatment, so I feel like going home to make this because it’s a rainy afternoon! Thanks for sharing! I must know where that beautiful dish towel came from! For those asking about a coconut flour substitute, I asked Joy on Instagram and she said it was developed for coconut flour but she’ll look into it. These bars look amazing! I love the use of almond flour ?